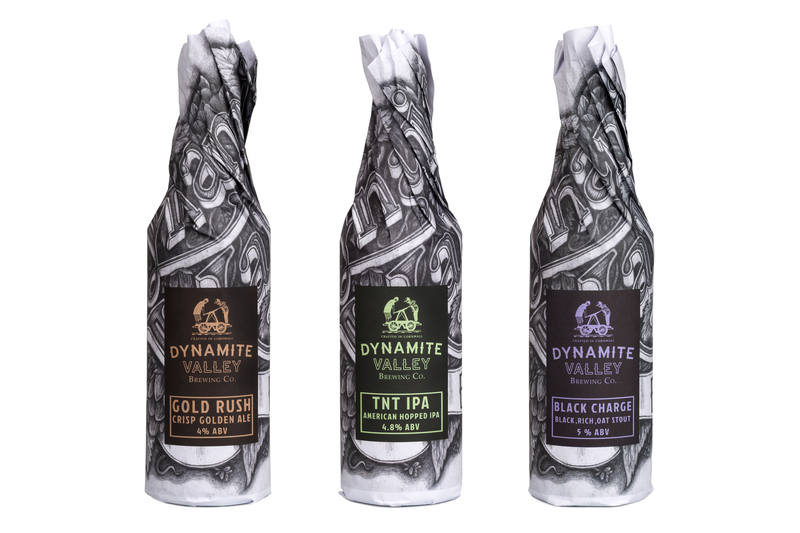 Here at Dynamite Valley, we’re proud to be producing delicious Real Ale crafted in Cornwall. We have spent the last few years sharing our passion for beer locally, with our ales available on tap at Cornish pubs, as well as hosting our own Beer Café. So, as you can imagine, we were very excited to be able to make our beers available in bottles, for you to enjoy at home, or even share with friends! Our range of bottles features seven of our popular ales. Our flagship ale, this classic and refreshing beer is very sessionable and has a smooth finish. A true summer beer, enjoy whilst crossing great expansive plains and mountain ranges… or a family barbeque. You’ll discover a refreshing and crisp beer, a classic wheat haze and definitely oranges (bottle conditioned). Fresh and easy drinking, with lemon and peach flavours. Hop and pine notes on the nose, with a light amber hue and a peach and grapefruit taste. This stout has a smooth, creamy mouthfeel, with a sweet finish and a well-balanced malty body. Well rounded, amber coloured ale, caramel and floral flavours with a sweet finish. Ruby red, single hopped with a rich sweetness and hoppy finish (bottle conditioned). Our bottles are available from the brewery and from retailers across Cornwall. Plus, trade accounts can buy them online. We can’t wait to share our beer with more of you!